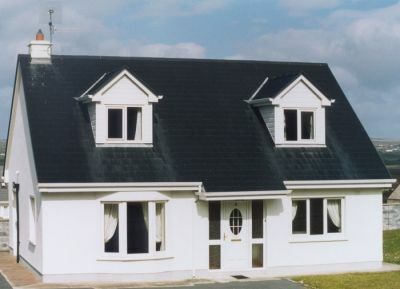 These detached Irish holiday homes are situated 700 metres from the town of Lahinch in Co. Clare, Ireland. These houses offer superb, self-catering accommodation in one of Ireland’s best loved holiday areas. Lahinch is famous for its beautiful blue flag beach, lively bars, restaurants, and excellent links golf course. Located on the promenade overlooking the Atlantic Ocean is Lahinch Seaworld & Leisure Centre; which boasts one of Ireland’s largest indoor aquariums. Just opened a new gym and fitness centre, Gymworld, in addition a full sized swimming pool with Jacuzzi, Sauna, Tanning Room and other amenities. Included is kiddies play area, ‘Sammy sharks’, offers hours of endless fun for 2 to 10 year-olds and for the whole family there’s the cafe Sicillian providing delicious fresh food, tea, coffee and more. The bright spacious accommodation includes a beautifully decorated living / dining room and spacious kitchen. These are 3 bedroomed houses all ensuite that sleep 6. Comfortable 3 beds with ground-floor double ensuite, and upstairs with double and a twin.Features TV Kitchen including microwave, dishwasher, washing machine/dryer Bed linen and duvets provided Beds are made upon arrival. Oil Central Heating. Cots are available on request. Private car parking. From Shannon: Take N18 to Ennis via Clarecastle, N85 to Inagh, N87 to Lahinch via Ennistymon. From Dublin: Take N7 to Limerick. In Limerick take the N18 to Ennis via Clarecastle, N85 to Inagh then N87 to Lahinch via Ennistymon. From Cork : N20 to Charleville, at Junction N21/R526 take 2nd slip road to join dual carriageway (signposted Limerick, Dublin), R509 to Limerick & follow signs to City Centre. In Limerick take the N18 to Ennis via Clarecastle, N85 to Inagh, then N87 to Lahinch via Ennistymon. In Lahinch Go to the top of the town and follow the coast road. Take the second left turn and then left again, the are located in a quiet cul-de-sac.